BEHR Chalk Decorative Paint is an easy way to create a unique and trendy look for your next paint project. BEHR's wide variety of paint colours, paired with BEHR Decorative Waxes, make every application completely tailored to achieve the one-of-a-kind look you desire. Perfect for refreshing old and new wooden furniture, cast stone, concrete, and even metal surfaces to create unique accent pieces. CIL Woodcare Canadian Wood Oil delivers rich dimensional colour, extreme clarity and our strongest protection. Canadian Wood Oils formula features an optimized blend of penetrating natural oils, Canadian Climate protection package and is pre-tinted with premium pigment to enrich wood grain and deliver maximum colour richness. Its available in an exclusive palette of 3 sought-after Canadian wood tones, Natural, Canadian Cedar and Walnut Bark. Solid Colour Weatherproofing Wood Stain - Deep Base, 946 mL is rated 4.6 out of 5 by 224. Rated 1 out of 5 by Rabb from Stain bubbled and came off with wet weather My husband and I installed a beautiful natural cedar deck in August. 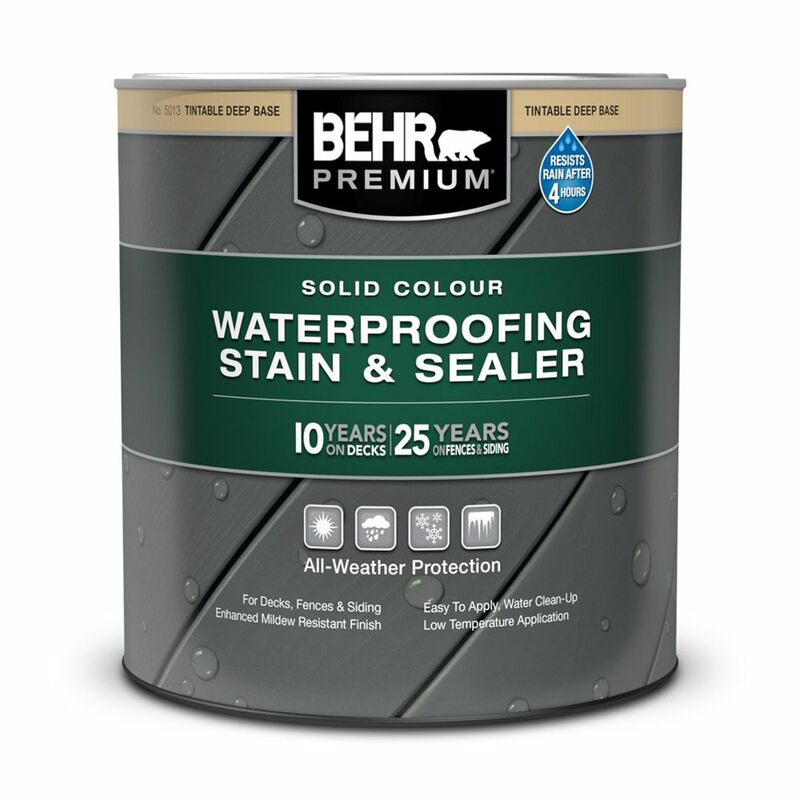 After much research I purchased the Behr Waterproofing Stain and Sealer. We followed the directions precisely for preparing the wood and applying the stain. Now, with the wet winter the stain has bubbled and come off. Terrible product! Huge disappointment to have to start over and sand the entire deck and find a new stain, not to mention the cost and labor which will not have to do again. Rated 3 out of 5 by hello from shows everything! 2 years ago we did our deck in the chatham fog color, (we thought a dark color would be too hot for our back deck since we have a vinyl fence so picked a light color). Anyway, although we like the color it gets dirty instantly. After rain the leaves leave a mark and then just general dirt shows up. I feel like I clean the deck more than my kitchen floor! Can't review the length of time that the paint lasts since it has only been 2 years. Rated 1 out of 5 by Boboo from Garbage First of all, it is not a stain. It does not penetrate the wood at all. It's just watered-down paint and a creative marketing department. I don't know why it would get any positive ratings when it is plainly not what they're calling it. I followed the instructions rigourously - 2 coats -, even bought and used the behr wash beforehand, and now, less than a year after application, it is flaking off. A real stain would not be doing that. Now I get to look forward to sanding off what is left and buying a different brand, from a different store, and repainting my deck. Skip the first steps and go find something that will work as it should the first time. Do not waste your money on behr. Find something with quality. Rated 2 out of 5 by SDvic from BEHR Premium Mildews I spent 3 years rebuilding/refurbishing my pier. I decided to use a BEHR Solid Color Waterproofing - After purchasing 33 Gallons and applying I noticed the area in the exposed area (not under the covered portion) is has mildewed. Note: I applied BEHR wood cleaner and pressured washed and let dry (2 Weeks) all areas before applying the Solid Color Waterproofing. I discussed this with the Home Depot paint department - they took my name/number and insured me the BEHR would call me within 24 hours - that was 6 months ago and I have not heard from them yet. Overall disappointed in the BEHR product and support.